If you're new to Android Studio or the IntelliJ IDEA interface, this page provides an introduction to some key Android Studio features. For specific Android Studio how-to documentation, see the pages in the Workflow section, such as Managing Projects from Android Studio and Building and Running from Android Studio. 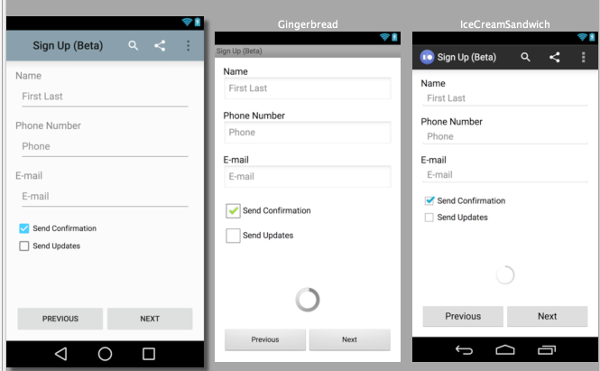 For a summary of the latest changes to Android Studio, see the Android Studio Release Notes. Shows the most important source directories at the top level of the module hierarchy. Groups the build files for all modules in a common folder. Groups all the manifest files for each module in a common folder. Shows resource files from all Gradle source sets. Groups resource files for different locales, orientations, and screen types in a single group per resource type. Figure 1. Show the Android project view. Figure 2. Show project build files. java/ - Source files for the module. manifests/ - Manifest files for the module. res/ - Resource files for the module. Gradle Scripts/ - Gradle build and property files. For example, Android project view groups all the instances of the ic_launcher.png resource for different screen densities under the same element. Note: The project structure on disk differs from this flattened representation. To switch to back to the segregated project view, select Project from the Project drop-down. 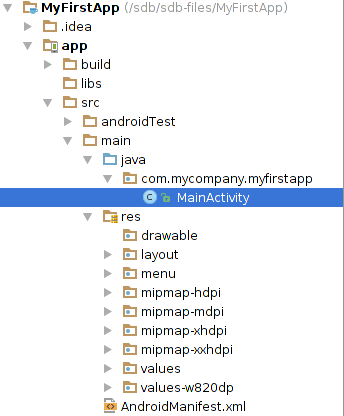 When you use the Project view in Android Studio, you should notice that the project structure appears different than you may be used to in Eclipse. 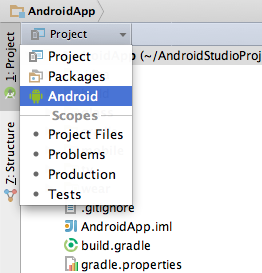 Each instance of Android Studio contains a project with one or more application modules. Each application module folder contains the complete source sets for that module, including src/main/ andsrc/androidTest/ directories, resources, build file and the Android manifest. For the most part, you will need to modify the files under each module's src/main/ directory for source code updates, the gradle.build file for build specification and the files under src/androidTest/ directory for test case creation. Figure 3. 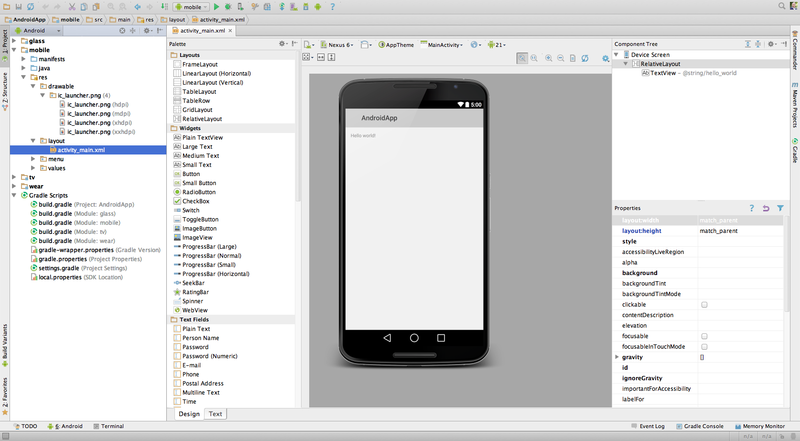 View Android Studio Project structure. For example, selecting the Problems view of your project displays links to the source files containing any recognized coding and syntax errors, such as missing an XML element closing tag in a layout file. For more information, see IntelliJ project organization and Managing Projects. Create multiple APKs for your app with different features using the same project and modules. Reuse code and resources across source sets. The flexibility of the Android build system enables you to achieve all of this without modifying your app's core source files. 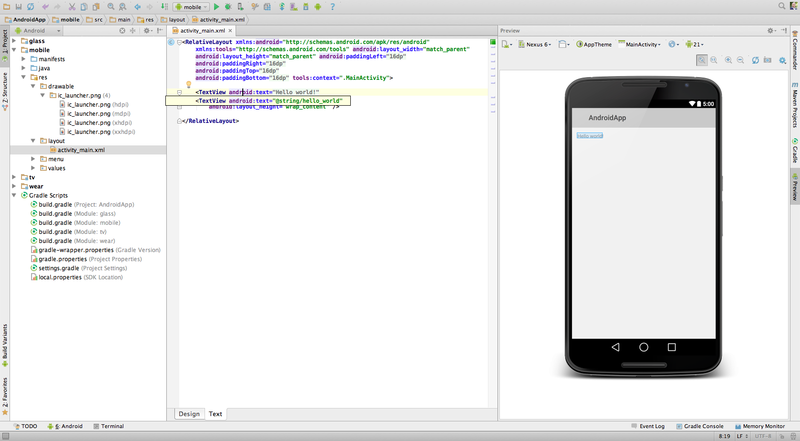 To build an Android Studio project, see Building and Running from Android Studio. 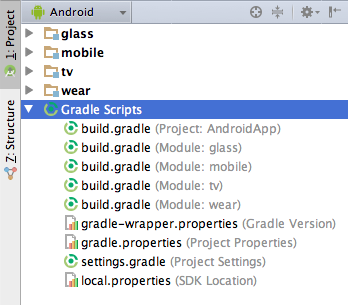 To configure custom build settings in an Android Studio project, see Configuring Gradle Builds. Android Studio provides a number of improvements to assist you in debugging and improving the performance of your code, including an improved virtual device management, inline debugging, and performance analysis tools. AVD Manager has updated screens with links to help you select the most popular device configurations, screen sizes and resolutions for your app previews. Click the Android Virtual Device Manager in the toolbar to open it and create new virtual devices for running your app in the emulator. The AVD Manager comes with emulators for Nexus 6 and Nexus 9 devices and also supports creating custom Android device skins based on specific emulator properties and assigning those skins to hardware profiles. Android Studio installs the Intel® x86 Hardware Accelerated Execution Manager (HAXM) emulator accelerator and creates a default emulator for quick app prototyping. For more information, see Managing AVDs. To enable inline debugging, in the Debug window click the Settings icon and select the check box for Show Values In Editor. Android Studio provides a memory and CPU monitor view so you can more easily monitor your app's performance and memory usage to track CPU usage, find deallocated objects, locate memory leaks, and track the amount of memory the connected device is using. With your app running on a device or emulator, click the Android tab in the lower left corner of the runtime window to launch the Android runtime window. Click the Memory or CPU tab. Figure 4. Monitor memory and CPU usage. When you're monitoring memory usage in Android Studio you can, at the same time, initiate garbage collection and dump the Java heap to a heap snapshot in an Android-specific HPROF binary format file. The HPROF viewer displays classes, instances of each class, and a reference tree to help you track memory usage and find memory leaks. Figure 5. HPROF viewer with heap dump. To create a snapshot of the Android app heap memory, click the Dump Java Heap icon ( ) in the Memory Monitor. Android Studio creates the heap snapshot file with the filename Snapshot-yyyy.mm.dd-hh.mm.ss.hprof in the Capturestab. Double-click the heap snapshot file to open the HPROF viewer. To convert a heap dump to standard HPROF format in Android Studio, right-click a heap snapshot in the Captures view and select Export to standard .hprof. Android Studio allows you to track memory allocation as it monitors memory use. Tracking memory allocation allows you to monitor where objects are being allocated when you perform certain actions. Knowing these allocations enables you to adjust the method calls related to those actions to optimize your app's performance and memory use. Click the Start/Stop Allocation Tracking icon ( ) in the Memory Monitor. 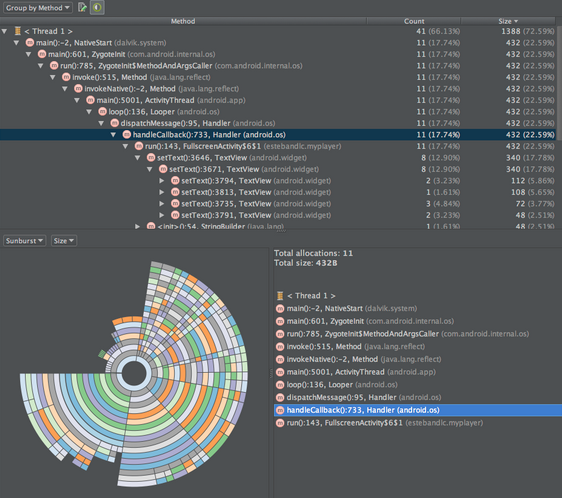 Android Studio starts tracking memory allocations. Perform the tasks whose mallocs you want to track. Click the Start/Stop Allocation Tracking icon again. Android Studio stops tracking mallocs and saves the data to a file named Allocation-yyyy.mm.dd-hh.mm.ss.alloc. The resulting file appears in the Captures tab. Double-click the file to open it in the allocation viewer. The allocation viewer allows you to view and analyze the allocations your app made while running. The Android SDK tools, such as Systrace, logcat, and Traceview, generate performance and debugging data for detailed app analysis. To view the available generated data files, click Captures in the left corner of the runtime window. In the list of the generated files, double-click a file to view the data. Right-click any .hprof files to convert them to a standard .hprof file format. In Android Studio, the configured lint and other IDE inspections run automatically whenever you compile your program. In addition to the configured lint checks, additional IntelliJ code inspections and annotation validation run to streamline code review. Hovering over an inspection error displays the full issue explanation inline for easy error resolution. There is also a helpful hyperlink at the end of the error message for additional error information. With Android Studio, you can also run lint inspections for a specific build variant, or for all build variants. You can configure the lint inspections that run by adding a lintOptions property to the Android settings in the build.gradlefile. 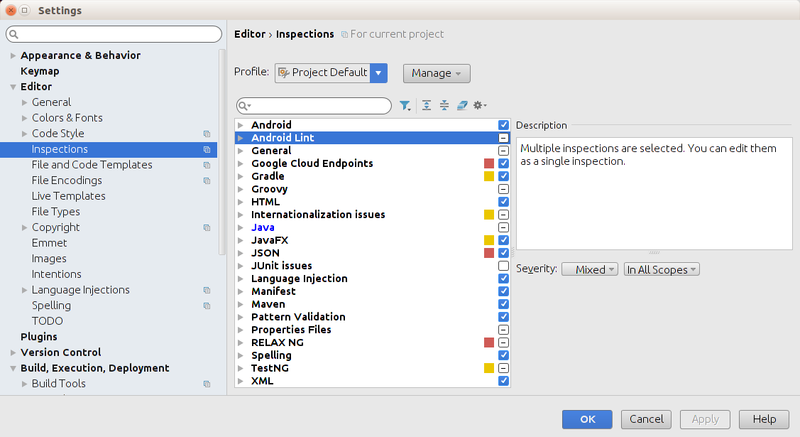 You can also manage inspection profiles and configure inspections within Android Studio. Choose File > Settings >, expand the Editor options, and select Inspections. The Inspection Configuration page appears with the supported inspections. Note: To change the behavior of specific inspection notifications, change the inspection severity, for example fromwarning to error. To manually run inspections in Android Studio, choose Analyze > Inspect Code. The Inspections Scope dialog appears so you can specify the desired inspection profile and scope. You can also run lint inspections from the command line in your SDK directory. Note: The lint --show and --list flags can be used to display the available issues and explanations. For more information, see Improving Your Code with lint and lint tool. Select File > Project Structure. In the Project Structure dialog, select the desired module, click the Dependencies tab. Click the icon to include a Library dependency. In the Choose Library Dependency dialog, select support-annotations and click Ok. The build.gradle file is updated with the support-annotations dependency. You can also manually add this dependency to your build.gradle file, as shown in the following example. The analysis then automatically inserts the appropriate null annotations in the detected locations. To run a nullability analysis in Android Studio, select the Analyze > Infer Nullity menu option. Android Studio inserts the Android @Nullable and @NonNull annotations in detected locations in your code. After running a null analysis, it's good practice to verify the injected annotations. You can also manually add nullability, resource, and enumerated annotations throughout your code to perform validations for a variety of reference values, such as R.string resources, Drawable resources, Color resources, and enumerated constants. Run Analyze > Inspect Code to validate the configured annotations. For a complete list of the supported annotations, either use the auto-complete feature to display the available options for the import android.support.annotation. statement or view the contents of the Support-Annotations library. For more details about Android annotations, see Improving Code Inspection with Annotations. Figure 6. Hello World App with Design View. Figure 7. Hello World App with text view. Easily select and preview layout changes for different device images, display densities, UI modes, locales, and Android versions (multi-API version rendering). Figure 8. Multi-API version rendering. From the Design View, you can drag and drop elements from the Palette to the Preview or Component Tree. The Text View allows you to directly edit the XML settings, while previewing the device display. When you build and run your app with Android Studio, you can view adb and device log messages (logcat) by clickingAndroid at the bottom of the window. If you want to debug your app with the Android Debug Monitor, you can launch it by clicking Monitor in the toolbar. The Debug Monitor is where you can find the complete set of DDMS tools for profiling your app, controlling device behaviors, and more. It also includes the Hierarchy Viewer tools to help optimize your layouts. Where To Find New App Ideas?